Samford University’s Orlean Beeson School of Education held its 36th annual award ceremony May 4 to recognize the many accomplishments of the school’s undergraduate teacher education students. Twelve scholarships totaling more than $35,000 were awarded to students pursuing a career in teacher education. 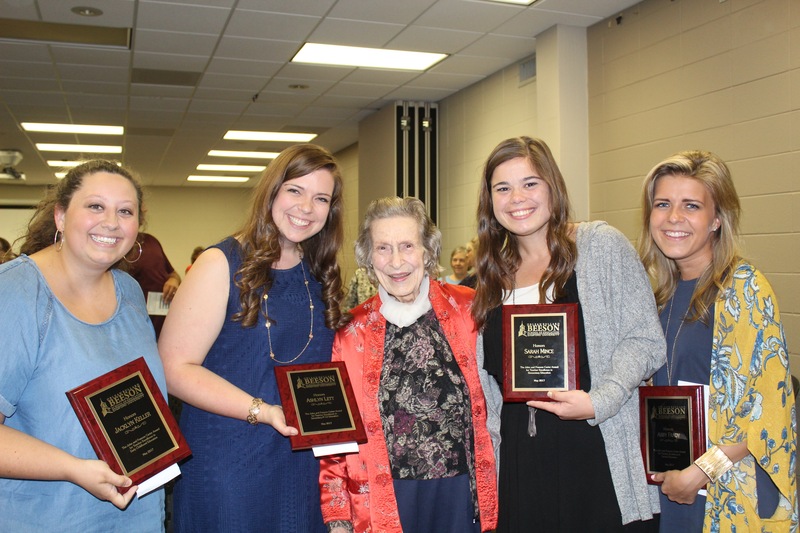 Catherine Frances Campbell, a sophomore from Northport, Alabama, received the Velma Wright Irons Memorial Scholarship, which is awarded to a student who has exemplified strong goals toward pursuing a career in education. Emily Beroth, a sophomore from Valencia, California, received the Kathryn Abercrombie Scholarship, which recognizes a student who has achieved a high academic standing and exemplified outstanding character in the field of education. Angela Napolitano, a junior from Daphne, Alabama, was awarded the Cooper and Dark Endowed Scholarship. This scholarship is made possible through the generosity of Edwin W. and Billie B. Bleier, who give in memory of their aunt and uncle, Jo Cooper and Henry W. Dark. Both Cooper and Dark served as teachers throughout their professional careers. Mary Michael Jaquess, a junior from Daphne, Alabama, received the Alabama Power School of Education Endowed Scholarship, which was given in honor of Rev. Terry W. DeFoor. Maggie Hohfeler, junior from Coppell, Texas, was awarded the Anne Glaze and William C. Stone Scholarship, which was established in memory of Charles R. Glaze and to honor Ila G. Glaze. Ralph and Orlean Bullard Beeson, for whom the school was named, established several scholarship awards to recognize academic excellence, leadership, participation in campus activities and professional promise. This year’s recipients were Jacklyn Keller, a senior from Vinemont, Alabama; Jessie Gholson, a sophomore from Nashville, Tennessee; Hailee Underhill, a junior from Johns Creek, Georgia; Jessica Ray, a junior from Alpharetta, Georgia; Cara Prince, a junior from Woodstock, Georgia; Caitlin Berry, a senior from Berkeley Lake, Georgia; and Ashlyn Lett, a junior from Pell City, Alabama. Several academic awards were presented at the event as well. The Academic Achievement Award is awarded to students with the highest GPA for their year of study in their selected program. This year, the Early, Special Education, Elementary Childhood Collaborative program junior class recipient was Julia Bickley, from Edmond, Oklahoma. The senior class recipient was Kristen Fuller, from McCalla, Alabama. The Secondary Education program recipient for the junior class was Mackenzie Epps, from Burford, Georgia; and the senior class recipient was Mattie Newson, from Charlotte, North Carolina. The Martha B. Ralls Most Promise as an Exemplary Teacher recipients were seniors Alan Lane from Alpine, Alabama, and Grey Adams Fairhope, Alabama. The Most Promise to be a Teacher Leader recipients were seniors Ellie Knox from Murfreesboro, Tennessee, and Mattie Newson from Charlotte, North Carolina. Abigail Hancock, a senior from Roswell, Georgia, won the Kappa Delta Pi, Zeta Theta Chapter Award for Excellence in the Field of Education. Jensen Harper, a senior from Lebanon, Ohio, won the Ira F. Simmons Award. Lauren Valentino, a senior from Alpharetta, Georgia, received the Award for Outstanding Innovative Practice in P–12 Education and Hannah Snell, a senior from Raleigh, North Carolina, received the Carol D. Dean Award for Outstanding Service. The John and Frances Carter Award for Teaching Excellence is awarded annually to four students who exemplify excellence in their chosen teaching area. This year, senior Jacklyn Keller from Vinemont, Alabama, received the award for early childhood education. Junior Sarah Mince from Vestavia Hills, Alabama, received the award for elementary education. Senior Abby Frady from Brownsboro, Alabama, received the award for special education. Junior Ashlyn Lett from Pell City, Alabama, received the award for secondary education. Box also presented the 2017 Golden Apple Award to Lauren Lunceford from Vestavia Hills, Alabama. The Golden Apple is presented annually to an outstanding alumni educator who has shown excellence in and outside the classroom since graduation. Lunceford completed her undergraduate degree and master’s in gifted education at Samford. She teaches second grade at Cherokee Bend Elementary and was recently named their Teacher of the Year. Additionally, she is involved in supporting education efforts in Uganda. Guest speaker and alumna Alyssa Barnes, an early intervention teacher, encouraged students to reach beyond their comfort zones as they move forward in their careers. “Don’t stay somewhere because you are comfortable. Step outside your comfort zone and take a risk. That is where the magic happens,” said Barnes.